Whispers in the Loggia: "The Holy Spirit Renews the Earth" – On Pentecost, The Church Is "Born"... And "Sent"
"The Holy Spirit Renews the Earth" – On Pentecost, The Church Is "Born"... And "Sent"
A liturgical feast on a par with Christmas – indeed, the moment which marks the commissioning of Christ's own as leaven in the world – on this Pentecost, Church, Happy Birthday to one and all. “As the Father has sent me, even so I send you... Receive the Holy Spirit” (Jn 20:21-22); this is what Jesus says to us. The gift of the Spirit on the evening of the Resurrection took place once again on the day of Pentecost, intensified this time by extraordinary outward signs. On the evening of Easter, Jesus appeared to the Apostles and breathed on them his Spirit (cf. Jn 20:22); on the morning of Pentecost the outpouring occurred in a resounding way, like a wind which shook the place the Apostles were in, filling their minds and hearts. They received a new strength so great that they were able to proclaim Christ’s Resurrection in different languages: “They were all filled with the Holy Spirit, and began to speak in other tongues, as the Spirit gave them utterance” (Acts 2:4). Together with them was Mary, the Mother of Jesus, the first disciple, there too as Mother of the nascent Church. With her peace, with her smile, with her maternity, she accompanied the joyful young Bride, the Church of Jesus. The word of God, especially in today’s readings, tells us that the Spirit is at work in individuals and communities filled with himself; the Spirit makes them capable of recipere Deum [receiving God], capax Dei [with the capacity for God], as the holy Church Fathers say. And what does the Holy Spirit do with this new capability which he gives us? He guides us into all the truth (cf. Jn 16:13), he renews the face of the earth (Ps 103:30), and he gives us his fruits (cf. Gal 5:22-23). He guides, he renews and he makes fruitful. 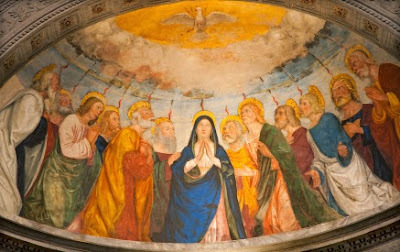 In the Gospel, Jesus promises his disciples that, when he has returned to the Father, the Holy Spirit will come to guide them into all the truth (cf. Jn 16:13). Indeed he calls the Holy Spirit “the Spirit of truth”, and explains to his disciples that the Spirit will bring them to understand ever more clearly what he, the Messiah, has said and done, especially in regard to his death and resurrection. To the Apostles, who could not bear the scandal of their Master’s sufferings, the Spirit would give a new understanding of the truth and beauty of that saving event. At first they were paralyzed with fear, shut in the Upper Room to avoid the aftermath of Good Friday. Now they would no longer be ashamed to be Christ’s disciples; they would no longer tremble before the courts of men. Filled with the Holy Spirit, they would now understand “all the truth”: that the death of Jesus was not his defeat, but rather the ultimate expression of God’s love, a love that, in the Resurrection, conquers death and exalts Jesus as the Living One, the Lord, the Redeemer of mankind, the Lord of history and of the world. This truth, to which the Apostles were witnesses, became Good News, to be proclaimed to all. Then the Holy Spirit renews – guides and renews – renews the earth. The Psalmist says: “You send forth your Spirit… and you renew the face of the earth” (Ps 103:30). The account of the birth of the Church in the Acts of the Apostles is significantly linked to this Psalm, which is a great hymn of praise to God the Creator. The Holy Spirit whom Christ sent from the Father, and the Creator Spirit who gives life to all things, are one and the same. Respect for creation, then, is a requirement of our faith: the “garden” in which we live is not entrusted to us to be exploited, but rather to be cultivated and tended with respect (cf. Gen 2:15). Yet this is possible only if Adam – the man formed from the earth – allows himself in turn to be renewed by the Holy Spirit, only if he allows himself to be re-formed by the Father on the model of Christ, the new Adam. In this way, renewed by the Spirit, we will indeed be able to experience the freedom of the sons and daughters, in harmony with all creation. In every creature we will be able to see reflected the glory of the Creator, as another Psalm says: “How great is your name, O Lord our God, through all the earth!” (Ps8:2, 10). He guides, he renews and he gives; he gives fruits. The world needs men and women who are not closed in on themselves, but filled with the Holy Spirit. Closing oneself off from the Holy Spirit means not only a lack of freedom; it is a sin. There are many ways one can close oneself off to the Holy Spirit: by selfishness for one’s own gain; by rigid legalism – seen in the attitude of the doctors of the law to whom Jesus referred as “hypocrites”; by neglect of what Jesus taught; by living the Christian life not as service to others but in the pursuit of personal interests; and in so many other ways. However, the world needs the courage, hope, faith and perseverance of Christ’s followers. The world needs the fruits, the gifts of the Holy Spirit, as Saint Paul lists them: “love, joy, peace, patience, kindness, goodness, faithfulness, gentleness, self-control” (Gal 5:22). The gift of the Holy Spirit has been bestowed upon the Church and upon each one of us, so that we may live lives of genuine faith and active charity, that we may sow the seeds of reconciliation and peace. Strengthened by the Spirit – who guides, who guides us into the truth, who renews us and the whole earth, and who gives us his fruits – strengthened in the Spirit and by these many gifts, may we be able to battle uncompromisingly against sin, to battle uncompromisingly against corruption, which continues to spread in the world day after day, by devoting ourselves with patient perseverance to the works of justice and peace. Lord, look upon your people as we await the Holy Spirit. Watch over our young people, watch over our families, watch over our children, watch over our sick, watch over our priests, consecrated men and women, and us bishops.... Watch over us all. And grant us that holy inebriation, the drunkenness of the Spirit, which enables us to speak all languages, the languages of charity, ever close to our brothers and sisters who need us. Teach us not to quarrel among ourselves to get a little more power; teach us to be humble, teach us to love the Church more than our own 'team,' than our internal squabbles; teach us to have a heart open to receive the Spirit. Lord, send forth your Spirit upon us! Amen.